As part of this blog, I plan on adding postmortems on previous projects every so and then. Here’s one I copied from my previous blog – Mitronite. A retrospective look at Project Z. For more background on what Mitronite was, see this previous post! One of my earliest projects with Game Maker Studio was Project Z – built around Feb/March 2013. I believe it was started with the free edition of GMS, which had full functionality, but simple limitation: you could have a maximum of 10 objects, sprites, rooms etc. This was just fine to start building a point and click zombie shooter, that just had a few weapons, only one type of enemy and a single map! After realising how easy and powerful GMS was, I went on to purchase the full edition. A few google searches later, and Project Z had goodies such as lighting effects, flares, fire, shadows, trees etc. You might recognise the sprites? Yes, the hero and zombies are slightly edited versions of the trooper from Command & Conquer! I typically start my projects using sprites from games. Not a problem, since I don’t usually start projects with the intention of releasing games commercially. It saves me time when prototyping, whilst still having a sleek look and feel. I think I am pretty good at drawing, but it’s very time consuming; As a one man team, this can be a huge bottle neck. I tend to prioritise working on the mechanics of the game and making sure it is fun before working on the graphics. Reusing game sprites is a nice shortcut and I find it more motivating to work with them, than with coloured boxes on a black screen! 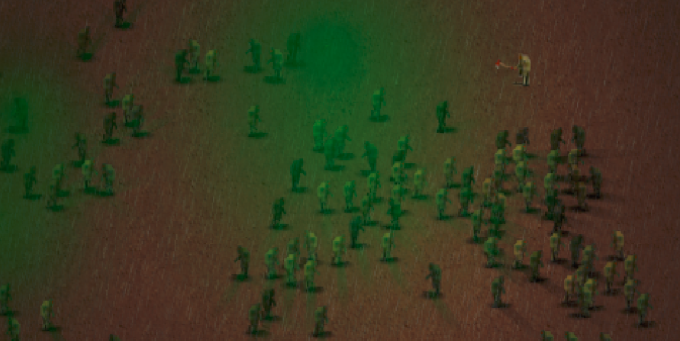 As you might see from the screenshots I produced a fairly playable prototype – hundreds of zombies spawned, some light & shadow effects using surfaces, 6 weapons including a flame thrower and even a stealth system! I had a lot of fun producing this prototype. Surfaces and nice graphical effects were on top of my list and came out quite nicely – Game Maker makes it pretty easy and there are a bunch of tutorials and code to reuse on the internet. Even stuff like dynamic shadows were simple to implement and looked reasonably good – although they were very poorly optimised, as I created a sprite shadow on the floor per zombie & light source! Fine on PC, but it would be a different story on mobile. However fun this little prototype was, the scope to turn this into a real game would have been pretty difficult. An endless brawler could have worked, but it was limited and not the kind of game I wanted to produce from it. I started having ideas on where to take the game – only to realise how difficult it would be to implement. Essentially this meant creating a whole new game, in which this prototype would only have covered the arcade sequences. Too much work than I wanted to sign up for! With this project I definitely put a good foot in the Game Maker universe. I discovered how easy it was to produce a quick prototype with advanced features and familiarised myself with the framework pretty quickly. Therefore it was a very encouraging first step towards the next projects! Previous Post: Finishing the splash screen for Dungeon Scroller!!! Next Post: Dungeon Scroller: What?!? Why? How and When?